The Eye-Stalker Bulbeel (ミズゾコデメウツボウ?, lit. : "Spotted River Bottom Moray") is an enemy found in Hey! Pikmin. It is a large purple lamprey-like creature that expands its massive mouth to swallow prey whole. It has some blue stripes and orange fins on its sides. 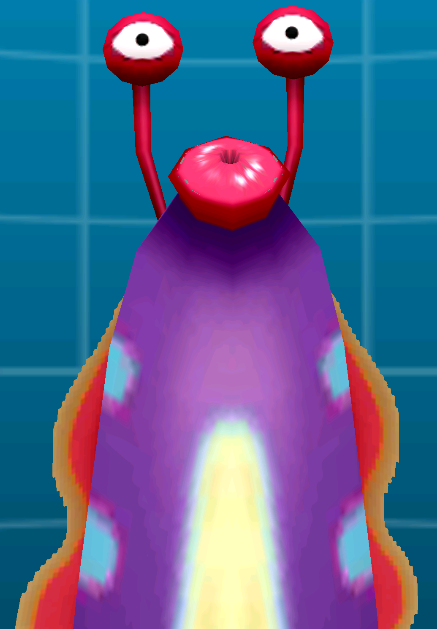 Its red mouth is usually puckered, but when attempting to eat Pikmin, it will become much larger. As the name implies, it has two eye-stalks that seem to always be squinting. It is about four times the width of Captain Olimar, and the parts that can be seen can stretch up to about 20 times his height. Its length is so massive that its entirety can't be seen, so it is unknown what its bottom looks like, or how tall it actually is. Particularly: Find out its health by looking into the game files. Eye-Stalker Bulbeels lie in wait for prey to pass overhead, after which they will disapear momentarily and then open their large mouths and lunge forward, attempting to swallow any Pikmin. After their lunge, they will slowly retreat back into their alcoves and wait for their next opportunity to strike. These creatures will also consume any other enemies that are below them while they lunge upwards, namely the Puckering Blinnows that are seen in most water levels. To do: List all places the enemy can be found in. Eye-Stalker Bulbeels have a lot of health and are best left avoided, but they can be killed, rewarding you with 15 Sparklium Seeds. To do so, simply lure them out of their homes and quickly lob Pikmin at their sides before they retreat. If Olimar is in the center of its reach when it lunges, he can be swallowed, which will kill him instantly. Otherwise, if he hits the creature's left or right side during the lunge, he will simply lose one bit of health. An Eye-Stalker Bulbeel poking through the bottom. This page was last edited on March 6, 2019, at 17:34.